Marathon Gold Corporation ("Marathon" or the "Company") today announced positive results from the winter 2016 drilling southwest from the Marathon Deposit, Valentine Gold Camp. The latest drill program consisted of 13 widely spaced step-out drill holes targeting mineralization underneath boggy areas of the property that are not amenable to drilling outside the winter. These holes were planned to extend the mineralization corridor associated with the Marathon trend and successfully intersected zones of variable quartz-tourmaline-pyrite (QTP) veining and penetrative alteration for up to 800 meters southwest of previous drilling completed in 2015. This veining and alteration pattern is typical of the gold mineralization found throughout the Valentine Gold Camp. Location map showing the 1.7 km strike length of the alteration - mineralized corridor including the 450 meters strike length of the current Marathon resource pit shell, 450 meters of high-priority drill targets and 800m SW extension of the mineralized corridor. The total strike length of the mineralized corridor now extends for at least 1.7 kilometers, including the 450 meters strike length of the current Marathon Deposit resource pit shell, 450 meters of high-priority drill target area immediately southwest of the resource, and 800 meters of lower priority drill target area defined by the latest drill holes MA-16-079 to 091 (Figure 1). Future infill drilling will target resource development along this extensive mineralized corridor. Additionally, step out drilling will focus along the 2.5 kilometers of unexplored ground located between the Sprite and Marathon deposit areas as well as the highly prospective ground to the northeast of the Victory Deposit. The new widely spaced (200 meters) step-out drilling has extended the mineralized corridor another 800 meters to the southwest along strike from previous drilling in the Marathon Deposit area; intersecting zones of alteration and QTP-Au veining with grades of up to 5.11 g/t Au over 2.1 meters (True Thickness) in MA-16-083, 4.84 g/t Au over 2.8 meters (TT) in MA-16-090, and 3.94 g/t Au over 2.1 meters (TT) in MA-16-087. Most of the holes hit alteration and typical QTP veining, often over 10 m or more although the gold values in most of these zones were less than 0.5 g/t Au. The widths of the zones with anomalous gold, demonstrate that the mineralized system is present and needs to be followed along strike 2.5 kilometers SW to the Sprite Deposit. The occurrence of visible gold and high-grade gold intervals, including 15.01 g/t Au over 1 meter in MA-16-083, 10.47 g/t Au over 1 meter in MA-15-078, 9.20 g/t Au over 1 meter and 9.69 g/t Au over 1 meter in MA-16-090, and 10.99 g/t Au over 1 meter in MA-16-087, within wide low grade alteration intervals is encouraging and suggests the proximity of better nearby mineralization. The total strike length of the mineralized corridor, including the Marathon Deposit resource pit shell, now extends for at least 1.7 kilometers. The highest priority infill drilling will focus on the 450 meters of strike length immediately southwest of the current Marathon Deposit resource pit shell. Planning is now underway for construction of a drill access road along the 2.5 kilometer length of overburden-covered ground located southwest from the Marathon Deposit to the Sprite Deposit area. The recent drilling at the Marathon and Sprite Deposit areas plus new geophysical interpretation suggests that the mineralized trend continues between these two deposits and that other open pit targets may exist. Late fall 2015 near surface drill holes not previously released for the Sprite Zone (VL-15-610 to VL-15-614) intersected up to 5.78 g/t Au over 2.8 meters (TT) and confirmed the NE continuation of the mineralized corridor from the Sprite resource pit shell. Future infill and step out drilling is planned for the Sprite Deposit area. In addition, drilling is planned for the area between Victory and Victory North East where geophysics indicates a possible extension of the Victory Deposit. "This 2016 step-out drilling campaign has succeeded in significantly increasing the strike length of the mineralized corridor SW from the Marathon Deposit and developing a host of infill drill targets for additional resource development," said Phillip Walford, President and CEO of Marathon. 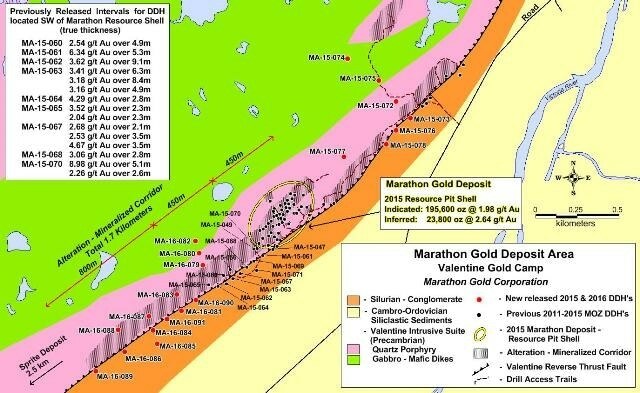 "Future exploration will involve a combination of infill and step-out drilling between the Sprite to Marathon and the Marathon to Victory Deposit areas, as well as continued prospecting and trenching, as we focus on developing a critical mass of open pit resources at the Valentine Gold Camp." TABLE 1: Significant assay intervals from the Marathon Zone drill holes MA-15-078, MA-16-079 to MA-16-091 and Sprite Zone drill holes VL-15-610 to VL-15-614. Marathon Gold Corporation acknowledges the financial support of the JEA Program, Department of Natural Resources, Government of Newfoundland and Labrador.